This sword and sorcery anime production is pretty damn cool and stars the extremely cute Lina Inverse, a red haired sorceress who is on the run from the powers that be for a crime that she did not commit... or DID SHE? Not really but I was hoping to build the suspense! 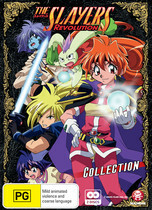 The tale begins with Lina exploring (what's new) for fortune and glory with her warrior partner Gourry. Unfortunately things go sour when they meet an inspector called Wizer. We soon discover that apparently Lina has destroyed a neighbouring kingdom's stock of animal weapons. These weapons are like super powered animals but as we get to the crux of the matter, it appears that Pokota, an evil rabbit-like creature is behind this dastardly act. With only one thing to do, Lina goes on the run in order to clear her name and find Pokota but thankfully she is once again joined by Gourry and some new recruits, namely Princess Amelia and her protector Zelgadis, a giant stone golem. 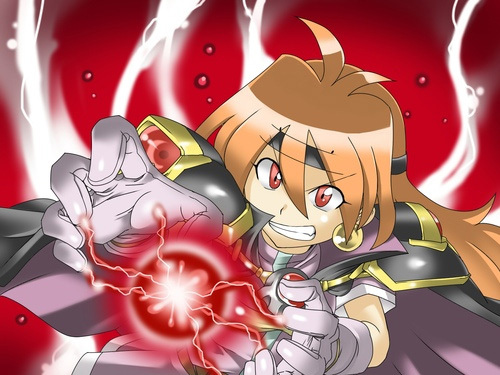 Another interesting protagonist in the series is Zellos, a mysterious mage whose alignment is yet to be known. Needless to say, he proves to be an annoyance to Lina but sometimes he does help. Without spoiling the story, this incarnation of the Slayers contains all 13 episodes and features that traditional over the top and witty storylines that made the previous series so damn enjoyable. With action, adventure, drama and intrigue, the comedic aspect of this series is actually very amusing, thanks to those clichéd anime characters and scenarios. Another highlight of this collection is the video quality that looks quite vibrant and colourful on DVD that boasts glorious widescreen and a Dolby Digital 5.1 track to really make the characters larger than life. There are even some explosive scenes in the series that BOOM through the surround sound system. In conclusion, Slayers Revolution Collection is a fun and over the top adventure that I thoroughly enjoyed from the first few minutes to the end of this 325 minute saga. Any more excitement and I would need an adult diaper! This is what anime is all about!